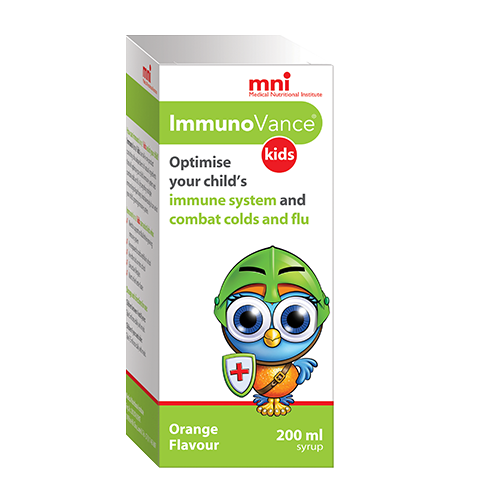 ImmunoVance Syrup optimises your child’s immune system and combat colds and flu. ImmunoVance Syrup’s unique blend of ingredients work together to ensure your child’s immune system functions optimally and is ready to defend them against bacteria and viruses. ImmunoVance syrup is ideal for children who are exposed to colds and flu in school, live active lifestyles or want to feel better faster. ImmunoVance, more than just a multi-vitamin. What does ImmunoVance® Syrup do? ImmunoVance® Syrup contains a unique blend of ingredients designed to work together ensure your child’s immune system functions optimally, develops to its full potential and is ready to defend them when exposure to bacteria and viruses increases. What does ImmunoVance® Syrup contain? ImmunoVance® Syrup contains a unique blend of vitamins, minerals and plant derived (phytochemical) ingredients that have the potential to support optimal immune function and development by acting on multiple pathways. This multi-modal action aids in enhancing the function of multiple aspects of the immune system, giving your child’s natural defences an advantage when faced with attack from the thousands of germs they come into contact with every day. Andrographis paniculata has been used in Chinese and Indian Traditional Medicine for over a thousand years for the treatment and prevention of colds and flu. Recent clinical studies, including double-blind, placebo-controlled trials have demonstrated its ability to reduce the duration and severity of upper respiratory tract and common cold related symptoms and illness. Astragalus membranaceus is a member of the pea family and has been used for treatment and prevention of respiratory tract and gastro-intestinal infections in Traditional Chinese Medicine. The herb has been shown to be superior to Echinacea in the activation of immune cells and is able to reduce symptoms of sickness such as nasal congestion and sneezing. Eleutherococcus senticosus has been used in the traditional medicinal systems of China, Japan and Russia for more than a thousand years. Its uses include the improvement of general health as well as disease prevention, with specific focus on combatting infections, especially when associated with increased psychological and physical stress. In humans, the combination of Andrographis and Eleutherococcus has been shown to outperform Echinacea in children with colds, reduce flu-related sick leave and reduce post-illness complications. Vitamin A is an organic compound with multiple functions important to growth, development, and maintenance of the immune system. Vitamin C is an essential nutrient involved in the repair of bodily tissue and immune function. Vitamin C is able to decrease the duration of colds in the general population and reduce the risk of contracting a cold in athletes. Vitamin D’s are a group of fat-soluble compounds with multiple biological effects. These include acting as a regulator of immunity and on cells of the immune system. Supplementation of vitamin D decreases the chances of catching colds and flu and other upper respiratory tract infections. Vitamin E is a group of anti-oxidants essential to health. The vitamin has been shown to boost immunity, improve the body’s response to vaccines, and reduce the occurrence of respiratory infections, including the common cold. Selenium is an essential trace mineral involved in a wide range of biological functions. It forms part of numerous proteins and is essential for optimal immune function. Zinc is a mineral vital to the function of the immune system. Studies suggest that athletes may be particularly susceptible to zinc deficiency, as large amounts are lost through sweat. Zinc is able to reduce the frequency, severity and duration of the common cold, respiratory infections and general infections. What is the usual dosage for ImmunoVance® Syrup? Children between 4 and 8 years: Take 10 ml once a day with meals. Children over 18 years: Take 15 ml – 10 ml once a day with meals. Children under 4 years: Use not recommended in children younger than 4 years. Who should not take ImmunoVance® Syrup? ImmunoVance® Syrup is generally well tolerated with a low side effect profile. Mild side effects may occur. Refer to the package insert for a full list of possible side effects. Side effects can be minimised by taking ImmunoVance® Syrup with meals. Contact your doctor if you experience any other symptoms. Where can ImmunoVance be obtained? The medicinal plant Andrographis paniculata is native to India and Sri Lanka and now commercially cultivated in Europe, Southern Asia and China. It is frequently used in Chinese and Indian Traditional Medicine for the treatment and prevention of upper respiratory tract infections such as influenza and the common cold, where its recorded use as an immune modulatory herb spans well over a thousand years. The aerial parts (leaves and stems) of the plant contain a wide variety of bioactive compounds that include flavonoids, flavones and lactones, many of which are totally unique to this plant. Of these, andrographolide is considered the main bioactive ingredient, and has been shown to have a number of beneficial effects on immune related cells and signalling pathways. These include anti-allergic and anti-inflammatory effects via the reduction of pro-inflammatory cytokines as well as mast-cell stabilization in vivo. As a whole extract, Andrographis paniculata has been found to be effective against several forms of respiratory tract infections and possess immune stimulatory and modulatory activity. Clinical studies, including double-blind, placebo-controlled trials have demonstrated its ability to reduce the duration of upper respiratory tract and common cold related symptoms. Extracts also help alleviate nasal, ear and throat complaints, and reduce fatigue and sleep disturbances by up to 52.7% more than placebo. On a cellular level, the plant has been shown to enhance the effectivity and proliferation of lymphocytes associated with the adaptive immune system. Studies have also shown that Andrographis displays potent anti-inflammatory effects, thereby assisting with the alleviation of disorders related to a dysregulated immune system. This medicinal plant, a member of the pea family and native to Northern China, Mongolia and Siberia, is one of the key medicinal herbal agents used in Traditional Chinese Medicine where its use has been documented for centuries. The Astragalus genus contains over 3000 species, of which Astragalus membranaceus is considered to be the most effective as a medicinal herb. Traditionally, it has been used to enhance the immune system and strengthen the mucous membranes of the airways and gastrointestinal system. Uses therefore include treatment and prevention of respiratory tract and gastro-intestinal infections. The plant contains over 126 secondary metabolites that display documented evidence of medicinal bioactivity. Of these, the major classes are saponins, flavonoids and polysaccharides. Saponins of the triterpenoid class, called astragalosides, are the most researched bioactives in the plant, although the polysaccharide fraction appears to be as important for its immune-regulatory effects. Research into Astragalus’ effects on the immune system have revealed benefits on several immune-modulatory cellular systems. In vitro and in vivo, extracts have been shown to enhance the proliferation and activation of T- and B-cells, macrophages and certain key enzymes involved in the adaptive and innate immune system. In humans, Astragalus was shown to be superior to Echinacea in the activation of T-cells. Studies have also demonstrated reductions in the symptomology of rhinitis, including nasal congestion, secretion, sneezing and itching. Commonly known as Siberian Ginseng, the roots and rhizomes of Eleutherococcus senticosus have been used extensively in the traditional medicinal systems of China, Japan and Russia for more than a thousand years. Its original uses include the improvement of general health as well as disease prevention, with specific focus on combatting infections, especially when associated with increased psychological and physical stress. In humans, Eleutherococcus has been shown to have beneficial effects on immunity through its ability to increase the number and activity of immune defensive cells, especially Cytotoxic T-cells, Helper T-cells and Natural Killer (NK) cells. Interestingly, this especially extends to cases of exercise induced Immunosuppression. Eleutherococcus has also been shown to reduce inflammation and allergic reactions. In traditional Chinese medicine, Eleutherococcus is often combined with Andrographis. This combination has been well researched and studies suggest several benefits, including a reduction of the symptoms of upper respiratory tract infections by up to 86%, especially coughing, sneezing, sinus pain and headache. The combination has also been shown to outperform Echinacea in children with colds, reduce influenza-related sick leave and reduce post-infective complications. Vitamin A is an organic compound with multiple functions important to growth and development, as well as the maintenance of the immune system. Deficiencies are common in developing countries, and can lead to poor immunity, especially if experienced during childhood. Vitamin A aids in the optimisation and regeneration of the mucous membrane barriers that act as protection against invading infective organisms. A deficiency also results in an impairment of the innate immune system, lymphocyte formation and antibody-mediated immune function. Vitamin C is an essential nutrient involved in the repair of bodily tissue and immune function. A systemic review of 29 trials involving 11,306 participants found that Vitamin C is able to reduce the duration of colds in the general population by 8 to 14%, and reduce the risk of contracting a cold by up to half in athletes. The vitamin D’s are a group of fat-soluble compounds with multiple biological effects. These include acting as a hormonal regulator of immunity, and on cells of both the innate and adaptive immune systems. Research suggests that sub-optimal levels are more prevalent than previously thought in the world, including in countries with high levels of sunlight. Supplementation demonstrates a decreased susceptibility to colds and flu and other upper respiratory tract infections in children by up to 40%. A systemic review involving 25 trials (11 321 participants) concluded that vitamin D was protective against acute upper respiratory tract infections, especially in deficient individuals. Vitamin D deficiency has also been shown to increase the risk of illness and injury in athletes. Vitamin E is a group of anti-oxidants essential to health. Supplementation has been shown to boost immunity, especially in the elderly, as well as improve T-cell mediated immunity and the proliferation of various Immunological cells. The vitamin is also able to improve the body’s response to vaccines, and helps to reduce the occurrence of respiratory infections, including the common cold. Selenium is an essential trace mineral involved in a wide range of biological functions. It forms part of numerous proteins, including antioxidant enzymes, and is essential for optimal immune function. Deficiencies are known to have a negative impact on the activation, differentiation and proliferation of both the innate and adaptive immune system. Zinc is an essential mineral that is required for the function of several enzyme systems involved in the immune system. Studies suggest that athletes may be particularly susceptible to zinc deficiency, as large amounts are lost through sweat. Zinc has undergone extensive research regarding its positive effects on immunity and the common cold. Supplementation has been associated with beneficial effects on immune cells such as macrophages and T-cells, as well as many immune related signalling molecules. When supplemented in the elderly, a reduced frequency of the common cold, respiratory infections and general infections has been documented. Furthermore, a meta-analysis including 1360 people from 15 trials concluded that zinc is effective in reducing the severity and duration of the common cold.